APV, Model MP12-5TBS, two stage, homogenizer. with rated output capacity of 420 gallons per hour – depending on materials, application and machine configuration. Maximum operating pressure up to 5,000 psi. Equipped with ball valve cylinders and standard style valve seat. Manual homogenizing valve actuator assembly with 2" OD / 1¼" ID seated bevel style charge port, ¼" NPT style discharge port and pressure gage up to 10,000 psi. Mounted on (4) leg heavy duty base frame. APV, Model MP12-5TBS, two stage, homogenizer. with rated output capacity of 420 gallons per hour – depending on materials, application and machine configuration. Maximum operating pressure up to 4,000 psi. Equipped with ball valve cylinders and standard style valve seat. Manual homogenizing valve actuator assembly with 2" OD / 1¼" ID seated bevel style charge port, ¼" NPT style discharge port and pressure gage up to 10,000 psi. Mounted on (4) leg heavy duty base frame. 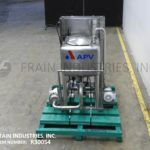 APV, 50 gallon, 304 stainless steel, high shear liquefier with amount of product per hour – depending on materials and application. Vessel dimensions of: 26" long x 26" wide x 20" straight wall. Equipped with 18" OD man way with flip top bolt down cover, bottom 10" OD 6 hole / 3 wing impeller and side mounted 7½ Hp motor drive. Cone bottom has 3" OD / 2½" ID side bottom discharge with 25" ground clearence. Control panel with push button start / stop control and variable speed control. APV 100 gallon, 316 stainless steel liquefier. Chamber dimensions: 40" in Length: 40" in Width; 15" straight wall. Equipped with 20" diameter man way, 12" bottom (6 hole / 3 wing / 6 blade) impeller, 3½" OD / 3 ID tri-clamp bottom discharge at 29" ground clearence and side mounted 25 Hp motor drive. Stainless steel tubular frame. Gallons of product per hour dependant on materials, application and machine configuration. APV, chocolate tempering system. Rated from 500kg to 2000 kg per hour – depending on materials, application and machine configuration. 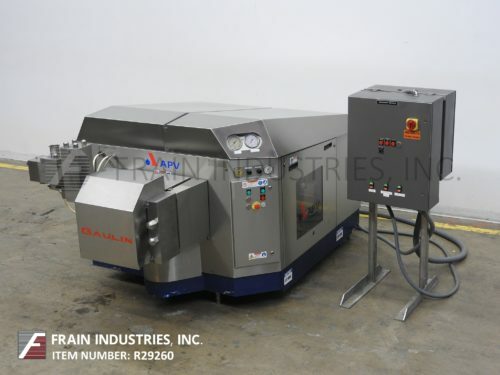 Equipped with a 24" OD x 56" H tempering chamber with (15) plates, water jacketed, 6000 Kw heater, scrape surface agitated zones with bottom mounted motor drive, top 3½"OD / 3" ID Tri-clamp and bottom 2½"OD / 2"ID Tri-clamp product ports. Mounted on (4) leg base frame with casters. APV, 350 gallon capacity, 316 stainless steel jacketed and insulated process tank. Vessel dimensions: 50" diameter x 48" deep with a 38" straight wall. Equipped with a dome top with an 18" diameter top hinged man way, (2) CIP spray balls supplied by a 2"OD / 1½"ID Tri-clamp fitting, (1) 9" wide fixed baffle, two speed 0.9/1.8 Hp top mounted scrape agitator and 3"OD / 2½"ID Tri-Clamp discharge with flow control valve and 18" ground clearance. APV Model G110T-75P, stainless steel, (2) stage, (3) plunger homogenizer with working capacities to 14,000 litres or 3,696 gallons per hour – depending on materials, application and machine configuration. Maximum operating pressure up to 210 bar or 2,000 psi. 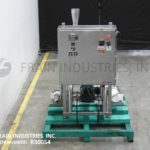 Equipped with (3) poppet, aseptic design, mechanical hydraulic plunger valves, (2) stage valve and hydraulic homogenizing actuator assemblies, low-noise insulation and high pressure outlet connections with pressure relief valve with maximum temperature of 105 Deg C or 221 Deg F. Stainless steel control panel has 1st and 2nd stage pressure gauges, start, stop oil pump and e-stop controls and all internal indicators placed behind side window pane. Mounted on heavy duty stainless steel base frame with concrete sub-frame for noise reduction, vibration dampering and better stability and height adjustable legs. 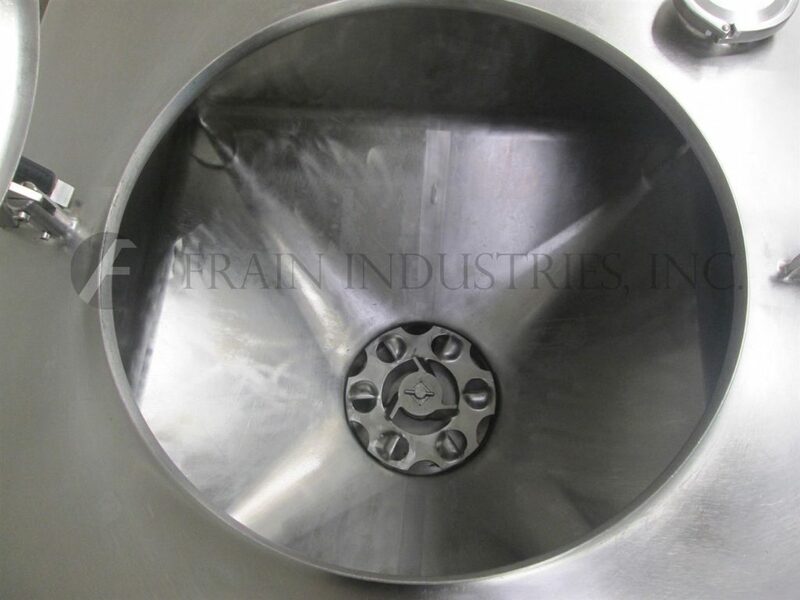 APV, 150 gallon, 304 stainless steel, single wall, liquefier. Production rates per hour – depending on materials and application. Chamber dimensions: 40" in Length; 40" in Width; 30" in Depth. Equipped with 24" diameter man way with flip up, bolt down cover, 6 hole / 3 wing impeller and 30 Hp bottom side mounted belt to motor drive with safety guarding. 3" OD / 2½" ID Tri-clamp style side bottom discharge with 19" floor clearance. Mounted on stainless steel (4) leg tubular base frame. APV, Model R57 MOD1, stainless steel, plate and frame heat exchanger. Approx 600 total ft² heat transfer area. Equipped with (89) plates 61" in Length; 16½" in Width; in (1) zone. (2) 3" OD / 2¾" ID Tri-clamp and (2) 9"OD / 4"ID 8-bolt flange style transfer ports. Mounted on a painted base frame with locking casters. APV, Model SR-35SH, plate and frame heat exchanger equipped with (37) 16"W x 46"L gasketed plates for 185 ft² surface area and 3½"OD/3"ID tri-clamp inlet and outlet ports.